How to watch Black Sails: Season 4 (2017) on Netflix Austria! Sorry, Black Sails: Season 4 is not available on Austrian Netflix, but you can unlock it right now in Austria and start watching! With a few simple steps you can change your Netflix region to a country like Hong Kong and start watching Hong Kongese Netflix, which includes Black Sails: Season 4. We'll keep checking Netflix Austria for Black Sails: Season 4, and this page will be updated with any changes. 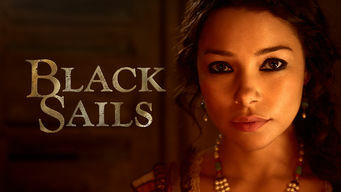 Black Sails: Season 4 is not available in Austria BUT it can be unlocked and viewed! Its population may be less than upright, but New Providence Island is home to pirate Capt. Flint, and he'll take on anyone who tries to claim it. Battles, treasure, intrigue! It's high adventure -- with lots of lowdown thievery. You've entered pirate waters, matey! Season 1 of Black Sails has 8 episodes. Because different Netflix countries have different availability for episodes, you'll need to check the episode listing below to see which are available in Austria. Captain Flint tries to stop a mutiny on the Walrus. John Silver comes aboard as a cook with a secret. Eleanor tries to keep order on New Providence. 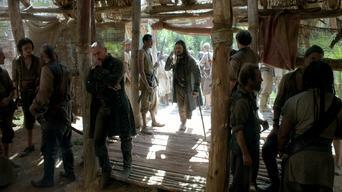 Silver and Max hide in a brothel while Flint's competitors search for the missing captain's log. Flint reveals the identity of the thief in his crew. Flint enlists another captain in his search for the wrecked Spanish galleon. 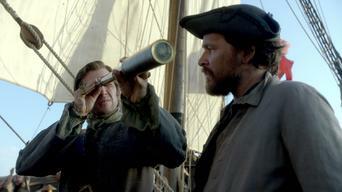 Silver and first mate Billy Bones try to identify the other mutineers. 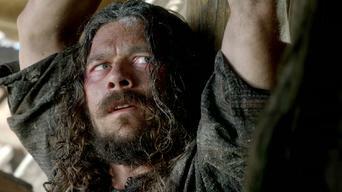 While the crew careens the hull of the Walrus, Silver warns Captain Flint about Billy's divided loyalties. Eleanor tries to cut a deal for cannons. The Walrus goes after the Andromache on the high seas. Eleanor faces a revolt in New Providence. Rackham and Vane take ownership of the brothel. The hunt for the Andromache costs Flint some of his crewmen. Eleanor gets a visit from a surprising ally. Billy learns more about Flint's past. Silver is accused of thievery. After Billy disappears, Flint explains himself. Eleanor loses an asset, and Max takes over management of the brothel. Silver divulges his secret to Flint, and the hunt for the Urca de Lima begins. Rackham is blackmailed over his past. Vane returns with a new crew. Season 2 of Black Sails has 10 episodes. Because different Netflix countries have different availability for episodes, you'll need to check the episode listing below to see which are available in Austria. As Flint and Silver face judgment for their crimes, Vane revels in his new position at the fort and Eleanor faces a threat to her control of Nassau. Flint puts his plan into action by offering advice to Dufresne. Silver cozies up to the crew with juicy gossip, and Meeks asks a favor of Eleanor. Flint returns to Nassau and encounters a problem. Rackham works on restoring his reputation, but worries about Anne. Vane stumbles on a surprise. Vane discovers the truth about Low's "special cargo" and receives a warning from Flint, while Eleanor struggles with a decision about the fort. Miranda tries negotiating peace for the island. As Flint's attack on the fort continues, Vane has no choice but to take matters into his own hands. Eleanor does her best to broker peace, but Vane gives her an ultimatum. Billy brings a warning. Bonny loses control and does the unthinkable. Billy shows he's a changed man. Disheartening news from the mainland causes a rift between Flint and Silver. Eleanor and Vane face off over Abigail. Flint and Miranda prepare to negotiate with Lord Ashe. Silver has an enlightening talk. Vane crosses the line, forcing Eleanor to deal with him. Eleanor reveals her ruthless side. Flint and Miranda must face up to their past. Anne makes her intentions clear to Jack as they set sail. 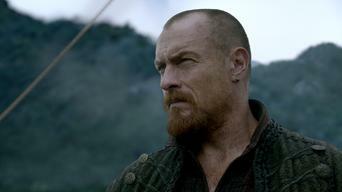 As Captain Flint awaits his trial, an unlikely pair comes to his aid. Vane's crew makes a decision, turning Silver from a cook into a future legend. Season 3 of Black Sails has 10 episodes. Because different Netflix countries have different availability for episodes, you'll need to check the episode listing below to see which are available in Austria. Rackham takes drastic measures to rebuild the fort. The Walrus is lured into a trap. Eleanor is offered a way out. An old mentor returns to Nassau. The Walrus crew battles the elements. Teach and Rackham disagree. Rogers and Eleanor discuss their partnership. Bonny fears for her future with Max. Flint pushes Silver to his limit while they're stranded at sea. Rackham takes charge as Nassau prepares to fend off an invasion. Civilization returns to Nassau, and sets its sights on Vane. Flint, Silver and Billy encounter a new enemy. Rackham takes a stand against his crew. With the fate of his men hanging in the balance, Flint makes the queen a bold offer. Max seizes an opportunity. Eleanor and Rogers face a new threat. Silver confides in Madi his true feelings toward Flint. Rackham finds a weakness in Rogers's conquest of Nassau. Flint and Teach duel for the fleet. Flint proposes a plan to reclaim Nassau using the cache. Spain makes an additional demand. Silver delivers a strong recruitment message for Flint. Eleanor senses something is amiss and alerts Hornigold. The governor's caravan is attacked, and a prisoner is taken. Max realizes a spy is among them. 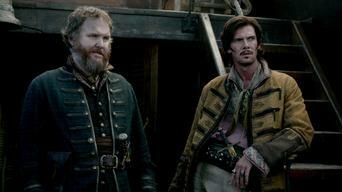 Flint and Silver execute a risky plan to fend off Hornigold. Billy sets out to turn public opinion against Eleanor. Teach gets news from Nassau. As Flint leads a ground army, Rackham and Bonny intercept a familiar-looking fleet. Silver gives Dobbs a chance to redeem himself. A legend is born. Season 4 of Black Sails has 10 episodes. Because different Netflix countries have different availability for episodes, you'll need to check the episode listing below to see which are available in Austria. Approaching the harbor with the fort in sight, Flint and his crew prepare to reclaim Nassau. But a hidden threat soon puts them at a disadvantage. Silver recognizes his captor from Teach's stories. Flint and his men easily overtake the plantation, but are baffled when the slaves refuse freedom. A spy for Berringer reports Max's meeting with Silver. Flint finds Silver just in the nick of time. Teach and his crew overtake the governor's ship. 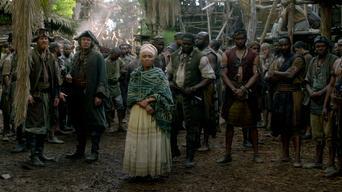 Anne leads a daring escape plan for the pirates imprisoned on the governor's ship. To avoid further battle, Eleanor makes Flint a tempting offer. 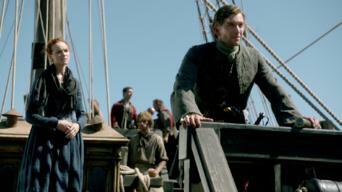 Eleanor sends an envoy to the governor's ship to relay special instructions. Faced with having to eliminate Billy, Silver has second thoughts. Silver hands Billy over to the former slaves in exchange for an alliance. Heading to the fort, Eleanor, Flint and Madi become easy targets. In Philadelphia, Rackham seeks help from Eleanor's grandfather. The governor offers a deal to Flint and Silver that's designed to divide them. Flint is stunned when Silver uses the cache as a bargaining chip for Madi's release. Madam Guthrie proposes a strategic marriage for Max. Silver's men catch up with Flint and the cache. A feeble navigator leads Rackham's crew toward Skeleton Island. A pre-emptive strike is launched. 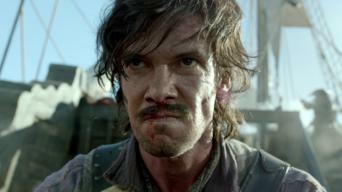 Rackham arrives at Skeleton Island and agrees to help rescue Madi and capture the governor. Silver finds a way to suppress Flint's hunger for war.